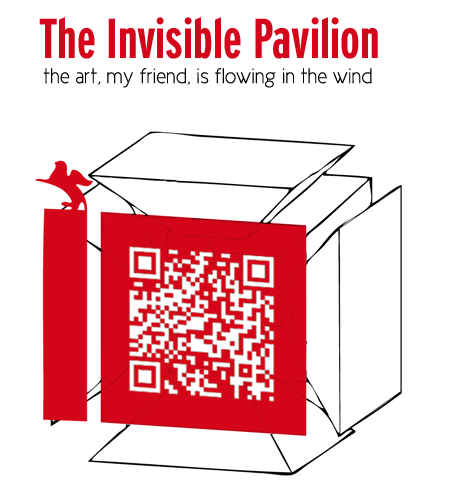 The Invisible Pavilion | The art, my firend, is flowing in the wind. The art, capsule my friend, rehabilitation is flowing in the wind. The Invisible Pavilion is a hallucinatory experience of rewriting the world, find an encouragement to increase the whirl and flow of information on invisible r/Reality. The Invisible Pavilion contains a r/Reality that is open and spontaneous, drawn and analysed from shared data. The double r reflects its double connotation—the lower case r refers to the everyday reality that we all know; the upper case R to a proprietary name, the augmented Reality that is produced. A word that is also a graphic mark signifying two meanings that are opposite though coexistent at the same time—the tangible and intangible, the visible and the invisible. The resulting experience is hallucinatory because it gives rise to a suspended sense of insight, which expands the boundaries of the world. A world understood here as a display surface, and as an extension of the exhibition space towards and infinite number of different planes of r/Reality. The Invisible Pavilion is, therefore, both occupying and occupied—occupying specifically the Biennale, but occupied in turn by a continuous stream of posts/objects from a blog/space shared by artists. A free, fluctuating flow of works in the form of signs and symbols, information and images, expressing the artefacts produced by a r/Reality that is always on, both night and day. This r/Reality is hence an hallucination unleashed. The aim and value of the initiative is precisely to increase the flow and make it an engine for interaction, to create a multi-author notice-board which is, in the end, a constant flow itself. A Pavilion which is experimental and without invitation, and which ultimately is not a provocation. It is, rather, a bit of black humour, casting a wink at the aura that shrouds the Biennale, that historic, promised land, which tends to lift in the midst of augmented reproducibility. An emblematic abstraction to decorate with illusion and signal change in a venue, a city, a place that speaks and interacts, that informs us continuously, non-stop. It announces that human-machine interaction, the interface, has become the urban environment, a collective external space, a Pavilion—an area in which to aggregate and share information in real time, which changes our perception of the physical venue through a gesture that transforms the city, a gesture by artists that are augmented town planners. Building this r/Reality was not, however, a conscious decision. It is a fact, a place where our town-planning artists have been thrown. It is a r/Reality that is not an object distinct from what it will become, but the object of its own becoming. The artist is the builder of what the world will become, the r/Reality that exists as an expression of art—an art that is no longer an interpretation of the world, but an act of dialectical transformation of the tangible and intangible, the visible and the invisible. For this r/Reality, for this Pavilion which “comes into being on its own”, artists have been invited to produce not just a “piece” of work, but rather a stream of “pieces”, a constant flow of work, for a curatorial project that reaches out and speaks to the Visible Biennale. Simona Lodi, art critic and curator, lives in Turin. Since 1993 she has been a contributor to variousleading contemporary art journals. Simona’s professional career spans New York, London and Turin—acity that has embraced the world of new technology and communication. It is in this context that the ShareFestival–Art in the Digital Age, of which Simona is founder and Art Director, has found fertile ground togrow and develop.